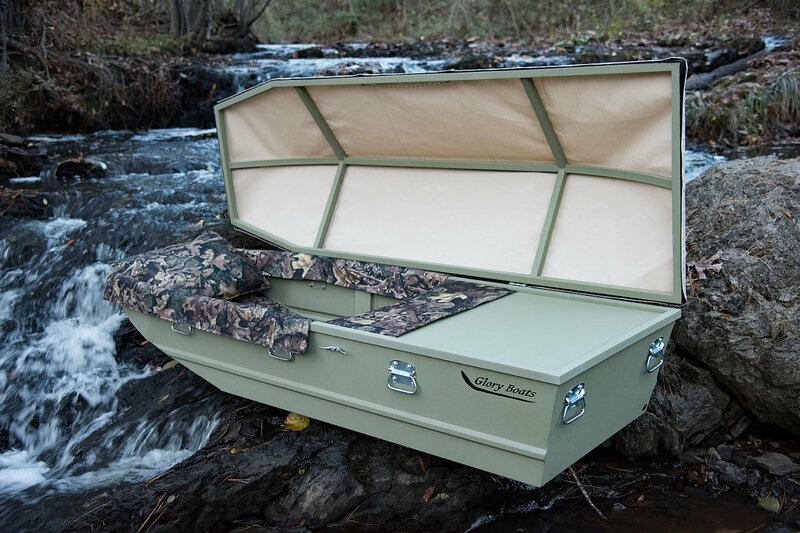 While they may not be NMMA-certified, the boat-shaped caskets made by Glory Boats sure look like they could be used for fishing. David Schmidt, a photographer in Little Rock, Ark., decided to design and build the caskets following an accident his father had several years ago. Schmidt’s father, Joel, an avid fisherman, suffered a horrific fall, and the outlook did not look good for the 79-year-old. “I realized that he may not come out of there, but I didn’t know what his funeral plans were,” Schmidt said. He asked his father about his plans for final arrangements. "If you hadn&apos;t told me what you wanted, I might have just buried you in your fishing boat," he joked. Joel Schmidt recovered, but the episode gave David Schmidt an idea: Why not create caskets that look like fishing boats? The company has a pamphlet called “The Map to the Far Shore,” which is handed out at shows, with information about funeral planning. Glory Boats has displays caskets in six funeral-home showrooms around Little Rock. Schmidt said most shoppers older than 80 prefer traditional coffins, but avid outdoors enthusiasts in the baby boomer generation are gravitating toward Glory Boats. The design took time, Schmidt said, because the weight capacity is 350 pounds, and the casket had to fit in a standard burial vault. The hull and top are built of 18-gauge steel, with an interior canvas cover over an aluminum frame. Schmidt says three more interior patterns will be available in the next few months.